While coaching a successful advisor, I quickly realized that he was – unconsciously and inadvertently – sending all the wrong messages to his clients, that worked to minimize his unsolicited referrals and introductions. The good news is that this is a fixable state of affairs. It’s simply a matter of awareness and then some adjustments in habits. Let’s start with YOUR awareness. Are you making any of these mistakes? 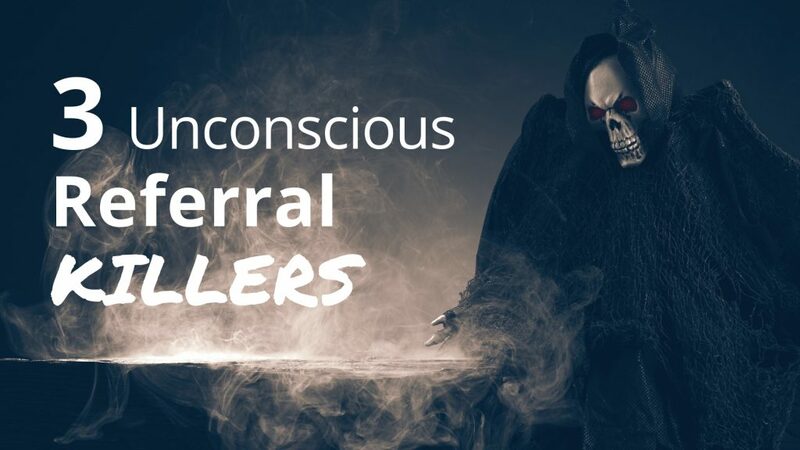 Are you a victim of any of these 3 silent Referral Killers? 1. Sending signals that the meeting is over – before you conduct the value discussion. If you don’t put Value Discuss (or similar words) on the agenda, or you make it seem like the meeting is over, before you get to it, your clients will mentally done with the meeting and thinking about where they’re headed next. The “I” in our V.I.P.S. Method™ stands for “Treat the request with importance.” Two ways to do this is to make sure you have enough time (working from an agenda) and not making this an afterthought, but building it into the meeting. 2. Sending signals that you’re too BUSY to take on new clients. You may have, inadvertently, said to your client, “I’m too busy to deal with any introduction you are thinking of making to me. You better send those great clients somewhere else.” Sad! 3. Sending signals that you’re too SUCCESSFUL to take on new clients. You dress like success: custom tailored suits and shirts with your initials on them. You drive like success: a top end automobile; possibly more expensive than many of your clients can afford. You keep time like success: a different watch each day that coordinates with your suit, belt, and shoes. Be careful! You just might be sending the message to your clients that “You’re done!” You might be sending the message that you are no longer interested in taking on new clients – even if they would be your next A+ clients. What works for you? Or what questions to you have? I’d love to hear from you. Please leave your comment below. We can all learn from each other. Thanks! How do we fix wearing nice clothes, driving a nice car and wearing a nice watch? I think you should dress, drive, and keep time in the range of your higher-level clients. I find nothing wrong with wearing a nice suit and nice watch, and I love a great car. Just be aware of the signals you might be sending to some of your clients. I think it’s a balance; meaning, your prospects and clients want to work with someone who is successful at what they do. A couple of examples to think about… if an advisor is feeling pressure toward their fees, the more expensive your car or watch, or boat, the more the clients might wonder about those fees. Most advisors in Michigan have two cars… one American made car to respect the auto industry up their way and another car like a Mercedes, BMW, Lexus, etc.